Welcome home! Enjoy the tranquility of North Chesterfield with the convenience of being just minutes from the highway and shopping. This home sits in an quiet cul-de-sac and features 4 large bedrooms and 2.5 full baths. The kitchen has been recently renovated and freshly painted with NEW custom cabinets , NEW granite countertops, NEW backsplash, New bar top overlooking family room with brick fireplace, stainless steel appliances, NEW island, large pantry, plenty of cabinet space, separate utility room with washer & dryer and additional storage and much much more. This home has an enormous fenced backyard and spacious deck perfect for entertaining. Whether you like spending your time indoors or outdoors, this home delivers. Looking for storage? There is a NEW walk up attic and this property is also equipped with a large shed for plenty of storage. The roof and heat pump was replaced in 2013. Upstairs youâ€™ll find large bedrooms and much more. At this price the possibilities are endless. This perfectly priced home in the Chesterfield County School district with No HOA is awaiting its new owner. Directions:Hull St., Left on Turner Rd, Right on Walmsley Blvd, Left on Newbys Bridge Rd, Left on Dortonway Dr, Left on Egan Rd, Right on Manning Rd, on Slate Rd, Left on Slate Ct.
SchoolsClick map icons below to view information for schools near 3503 Slate Ct Chesterfield, VA 23832. Home for sale at 3503 Slate Ct Chesterfield, VA 23832. 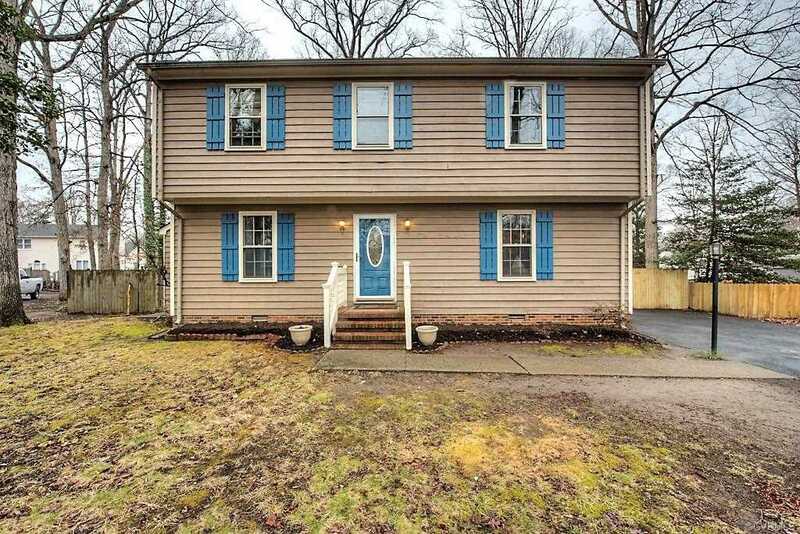 Description: The home at 3503 Slate Ct Chesterfield, VA 23832 with the MLS Number 1904024 is currently listed at $222,000 and has been on the Chesterfield market for 73 days. You are viewing the MLS property details of the home for sale at 3503 Slate Ct Chesterfield, VA 23832, which is located in the Belmont Hills West subdivision, includes 4 bedrooms and 3 bathrooms, and has approximately 1845 sq.ft. of living area.